FROM THE PRINCIPAL) LEARNING IS ABOUT EXPLORING, DISCOVERING, FEELING THE AWE OF NEW UNDERSTANDINGS, REALLY ENJOYING THE PROCESS AND BEING PERSONALLY ENRICHED BY THE EXPERIENCE. “WE KEEP MOVING FORWARD, OPENING NEW DOORS, AND DOING NEW THINGS, BECAUSE WE ARE CURIOUS, AND CURIOSITY LEADS US DOWN NEW PATHS” WALT DISNEY. F R O M T H E FOUNDATION 2017 MARKS THE 30TH ANNIVERSARY OF THE ST MARY’S FOUNDATION AND IT HAS BEEN A WONDERFUL OPPORTUNITY FOR THE FOUNDATION TO THANK AND RECOGNISE OUR SCHOOL COMMUNITY FOR THEIR GENEROUS SUPPORT OF THE SCHOOL. To mark this special milestone, the Foundation has provided funding of $400,000 for the renovations of the canteens, and has also committed funding to the development of a nature-based play area in the Junior School and an outdoor exercise park in the Senior School. We are also delighted to share that this year, gifts to Annual Giving have exceeded all previous totals. Over $132,000 has been raised so far and this is a powerful example of how many individual acts of giving, when combined, can make an enormous impact at St Mary’s. FOUNDATION CELEBRATES 30 YEARS OF G E N E RO S I T Y IT WAS AN EVENING OF CELEBRATION ON 24 OCTOBER WHEN THE ST MARY’S ANGLICAN GIRLS’ SCHOOL FOUNDATION CELEBRATED ITS 30TH ANNIVERSARY. WITH MANY OF THE DONORS WHO HAVE SUPPORTED THE SCHOOL SO GENEROUSLY IN ATTENDANCE, IT WAS AN OPPORTUNITY FOR PRINCIPAL, LYNNE THOMSON, AND THE CHAIRMAN OF THE FOUNDATION, RON FARRIS, TO PERSONALLY THANK EVERYONE FOR THEIR SUPPORT. After touring the school and visiting many of the areas of the campus which have been enhanced thanks to the generous support of donors, guests were treated to special performances by Year 11 and 12 students from this year’s production of Oliver! and Arianne Jacobs (’12), winner of the prestigious UWA VOSE Memorial Prize for Music in 2016. The Foundation was established in 1987 to ensure the continuing excellence in education at St Mary’s. Since then the Foundation has provided funding of almost $4.15 million to the school for capital development and other projects: purchased and developed the rural property, St Mary’s at Metricup, to the tune of $7.6 million; and today, has assets of over $30 million. A new award to recognise students’ commitment to music at St Mary’s has been established thanks to a bequest from Kerensa Allason (’89), who passed away in 2014. Kerensa joined St Mary’s in Year 11, inspired by the school’s music programme and keen to pursue TEE Music and her love of playing the oboe. Kerensa’s bequest means that future generations of St Mary’s musicians will be inspired by and recognised for their exceptional contribution to the music programme through the Kerensa Allason All Round Contribution to Music Award. The inaugural award was made by Kerensa’s mother, Mary Ellen MacDonald, to Year 12 student Amelia Hurst at the 2017 Music Dinner. Amelia has been involved in the music programme since she joined St Mary’s in Year 7 and contributes greatly to both St Mary’s Senior Strings and Hale St Mary’s Camerata. BISHOP RILEY BEQUEST SOCIETY ARSHYA KULKARNI, YEAR 12, PROVIDED GUESTS WITH A WONDERFUL INSIGHT INTO THE BUSY LIFE OF A ST MARY’S GIRL AT THE 2017 BISHOP RILEY BEQUEST SOCIETY DINNER IN AUGUST. SHARING STORIES FROM HER ST MARY’S JOURNEY, ARSHYA DESCRIBED THE MANY OPPORTUNITIES SHE HAS ENJOYED AND THE WARMTH AND SUPPORT SHE HAS EXPERIENCED AS A MEMBER OF THE ST MARY’S COMMUNITY. GUESTS WERE ALSO TREATED TO A BEAUTIFUL PIANO PERFORMANCE BY TINA ALGERI, YEAR 7. 2017 ANNUAL GIVING: CREATING OPPORTUNITIES THANK YOU TO EVERYONE WHO HAS BEEN A PART OF 2017 ANNUAL GIVING SO FAR THIS YEAR. YOUR GENEROSITY IS ALREADY MAKING A DIFFERENCE AROUND THE SCHOOL. FROM THE CHAPLAIN MY FIRST CAREER WAS IN THEATRE AS A STAGE MANAGER, AND LATER AS A COSTUME DESIGNER. AFTER ORDINATION I TRAINED AS A TEACHER TO SUPPORT MY ROLE AS A SCHOOL CHAPLAIN AND MY TEACHING AREAS, NOT SURPRISINGLY, ARE DRAMA AND HISTORY. Many people have commented on the change I made from theatre to the church, thinking them to be almost opposing forces! It seems odd, in this day and age, to consider the two to be at odds with one another, but it is a certain factor that at some points in history, the arts have been viewed as having a negative moral influence. According to the Tudor Poor Law of 1572, itinerant actors could be classed as "rogues" or "vagabonds" for not having an occupation, and punishable by whipping or even death. Actors in Elizabethan England, who played both male and female roles, (itâ&#x20AC;&#x2122;s a while before we women get a look-in) could dodge this law by forming troupes under the patronage of a noble or royal. In Britain during the Commonwealth, theatres were closed by an Act of Parliament for being a bad influence on the moral character of the people, along with idolatrous art, dancing and even Christmas! Thankfully, throughout most of Christian History, the arts, in all their forms, have been important to the Church and the way people collectively and individually express their faith. The arts and literature address the human need for beauty and hope as well as being a means to express despair and disappointment. In Christianity, the arts have helped the faithful to hear and see that divine good does prevail through the gifts that God gives to us, through the skills of visual artists, musicians, writers and actors. I love to visit cathedrals and churches when I travel, and I am struck by the curiosity and interest other visitors take in the stained glass, architecture, memorial plaques and symbols that have drawn them into the sacred space, all of which have the power to teach something about Christianity, its history and the connection generations of believers have had with a particular place of worship. During the July school holidays, I undertook a twoweek externship at Avanade Australia. Avanade is a global technology company formed between Microsoft and Accenture in 2000. The externship is part of their corporate social responsibility programme, developed to encourage more women into university courses and ultimately into the technology industry. In July, hundreds of educators from around the world gathered at Harvard University in Boston for the Project Zero Conference. We spent much of the week with 15 high school humanities teachers who proved to be an inspirational study group. BRED FROM AN OLD WORLD TEA ROSE BY DI DURSTON (WALLACE ’67), A LIMITED NUMBER OF ST MARY’S GIRL ROSES ARE AVAILABLE FOR PURCHASE THIS SUMMER. ‘St Mary’s Girl’ rose has a delightful pearly pink coloured loose bloom with a deeper reverse to the petal. The fragrance is typical of a Tea Rose with spicy and fruity under-notes. Di Durston is a member of Heritage Roses in Australia, past Chair of the World Federation of Roses Heritage Roses Committee and has travelled internationally sharing her knowledge and expertise. To order a rose, please phone (08) 9341 9120 or email oga@stmarys.wa.edu.au $10 from each sale will go to the St Mary’s Anglican Girls’ School Foundation’s Scholarship Fund which provides places for girls who could not attend St Mary’s without financial assistance. IN JUNIOR SCHOOL IN A SOCIETY SO IMMERSED IN TECHNOLOGY, IT IS IMPORTANT TO ALLOW TIME FOR CREATIVITY AND ENCOURAGE NATURAL CURIOSITY IN EVERY LEARNING SITUATION. WITHIN THE ST MARY’S JUNIOR SCHOOL, WE TEACH OUR YEAR 3 TO YEAR 6 GIRLS IN A NOVEL AND CREATIVE WAY, PROMOTING STUDENT GROWTH IN THE DEVELOPMENT OF ORIGINAL THOUGHT AND ACTION. Our Year 3 students have been actively using their creative thinking skills on their iPads to produce a short, animated comic strip to support their learning within the sustainability topic, Reduce, Reuse, Recycle. The girls have used curriculum content together with their digital technology skills to produce individual stop motions to showcase their understanding. So, what have our Year 5 students been up to, to develop their creative talents? Cannes, Sundance, Tropfest, St Mary’s Year 5s – all have one thing in common – a sensational Short Film Festival! During the last week in Term 3, our talented Year 5 students wrote and produced 12 fantastic five- to seven-minute long films. Every one of the girls was directly involved in every element – script writing, planning, costumes, acting, recording, editing and promoting their films. A major success of the project was the further development of the girls’ collaborative working skills. FROM THE MOMENT YOU ENTER OUR PETER ARNEY EARLY LEARNING CENTRE, YOU CAN SEE, HEAR AND FEEL A LEVEL OF EXCITEMENT AND JOY AS OUR YOUNGEST STUDENTS LEARN THROUGH EXPLORATION AND PLAY. Curiosity is innate in our Kindergarten and Preprimary girls as they move from specially-designed provocations carefully planned and prepared by their teachers, through to playground scenarios and adventures in nature within the neighbouring Trigg Bushland Reserve during Bush School. From an early age, children ‘wonder’ about everything that surrounds them. As educators, our main objective is to provide diverse learning opportunities through play for children to learn, as they discover, create, improvise and imagine. Play provides a supportive environment where children can ask questions, solve problems and engage in critical thinking. Through the Early Years Learning Framework, we believe that building upon children's experiences and prior knowledge provides the best foundation for learning in early childhood. After much discussion and exploration, the students learnt about the many concerns people have about our world. Some students had a particular interest in the past, and how the past has affected, and is still affecting, our world. These girls entered their projects into The National History Challenge for 2017, a research-based competition for students, giving them an opportunity to be historians where they could research world history, examine the past, investigate communities or even explore their own roots. The theme for 2017 was Making a Better World? and responses to this question ranged from “The role of zoos” to “The Stolen Generation”, “Malala Yousafzai” and “Socrates”. The level of work was fantastic, and presentations ranged from i-movies and posters to essays and books. Year 4 students, Grace McManis and Scarlett Jones, said they were inspired to create a book about Socrates because they had learnt so much about him in Philosophy and felt that he changed the world forever. The girls thought a book would help them share what they’ve learnt with others. Please read and enjoy the blurb of their book. CURIOUSLY EXPRESSING IDEAS WHAT DOES A POEM LOOK LIKE? ACCORDING TO YEAR 10 ENGLISH STUDENTS THIS YEAR, IT LOOKS LIKE A STAIRWAY, A SONG, A HANGING MOBILE, A FILM, A PAINTING, A PAPIER-MACHE GLOBE OF THE WORLD, A BODY ARRANGED WITHIN A CHALK DRAWING OR A MODEL OF A THEATRE. Year 11 Literature students imagined the social conflicts represented in the classic novel Jane Eyre in a different social setting. OVER THE LAST SIX YEARS, I HAVE HAD THE PLEASURE OF CO-ORDINATING THE SCHOOL’S PHILOSOPHY CLUB. JESSICA’S TWO LOVES CONVERGE YEAR 12 DANCE STUDENT, JESSICA GOLD, DESCRIBES THE PROCESS SHE UNDERTOOK TO CREATE HER MAJOR PRACTICAL WORK IN PREPARATION FOR THE WACE EXAMINATIONS. JESSICA’S CURIOSITY AROUND THE INNER WORKINGS OF THE BRAIN WAS THE DRIVING FORCE BEHIND HER COMPOSITION. 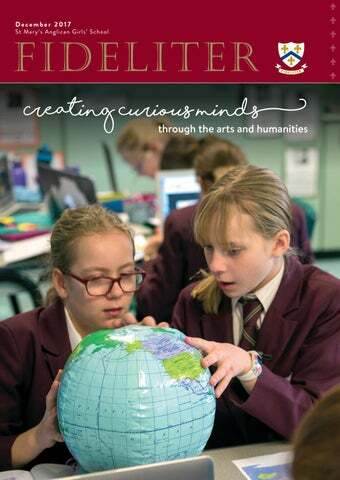 CURIOSITY IN THE ARTS In our classroom practice, we tinker and problem-solve our way through a variety of learner-centred projects in painting, printmaking, textiles, jewellery, modelmaking, ceramics and sculpture. Art enrichment allows for flexible thinking and exposure to ambiguity by investigating works from different times and culture. The inaugural New York Art and Design tour in January was a fantastic opportunity to view works of art at the Met, MoMA, The Frick Collection, Guggenheim, Cooper Hewitt Smithsonian Design Museum, Whitney Museum of American Art and Museum of Art and Design. Girls encountered memorable works addressing universal human concerns and conditions. Seven St Mary’s girls were state finalists in the Apex Australia Teenage Fashion Awards, and Hayley Henheffer (featured) won the Wearable Art section, and competed in the national competition. Locally, Year 11 Visual Arts and Media students attended aboriginal artist Tracey Moffatt’s exhibition, listened to a lecture by Australian film-maker, Gary Hillberg, and participated in a workshop with aboriginal film-maker, Curtis Taylor. CURIOSITY IN THE MEDIA IT WOULD SEEM THAT THE MOST IMPORTANT THING WE CAN TEACH OUR CHILDREN THESE DAYS IS HOW TO ASK BETTER QUESTIONS. WHEN IT COMES TO MEDIA STUDIES, STUDENTS ARE ENCOURAGED TO ASK QUESTIONS, THINK OUTSIDE THE BOX AND LET THEIR CREATIVITY AND CURIOSITY GUIDE THE WAY. TEACHERS FOSTER CURIOSITY IN HASS Students are naturally curious, but it is the role of the teacher to foster this curiosity and lead and motivate students towards deeper learning, inquiry and understanding. In the Year 7 Geography topic of ‘Water’, students were given a cup of St Mary’s water from the school drinking fountains. Using the strategy of “See, Think, Wonder”, students were asked: where does this water come from? Rather than teaching a top down or teacher-directed lesson about the facts of Perth’s water supply, curiosity, deep learning and understanding can be fostered by what David Perkins from Project Zero 2017 called “Taming the Wild”. Music, in all its forms, finds its basis in curiosity and imagination. On hearing or learning a new piece of music, the listener may find themselves curious about many aspects of the composition. They may be curious about the tangible features of the music. Then there are also the less tangible attributes that may force the listener to dig a little deeper for the answers. They may wonder about the inspiration behind the music, the emotions it arouses, and the pictures it creates in the imagination. In the classroom, they are exposed to music of many different eras and styles. Our students are guided and encouraged to investigate and interpret the artistic features of each piece. Outside of the classroom, in the many ensembles available to our students, there is valuable collaboration between instruments or voices to create music. At St Mary’s, we give our students many opportunities to develop their curious minds in their study of music. Our music has curiosity at its heart. Curious minds look to the past for instruction, the present for inspiration, and the future for imagination. IT IS A RARE STUDENT WHO IS NOT CURIOUS ABOUT OTHER CULTURES. EVEN THE SIMPLEST OF ANECDOTES OR SMALL CULTURAL SNIPPET WILL FIRE THEIR IMAGINATION. OUR GIRLS LOVE TO IMAGINE THEMSELVES LIVING IN JAPAN, FRANCE OR ITALY. A REWARDING EXPERIENCE FOR STUDENTS THIS YEAR, YEAR 10 STUDENTS PARTICIPATED IN TWO ABORIGINAL IMMERSION TRIPS WITH CHRIST CHURCH GRAMMAR SCHOOL. THE TRIPS RAN IN WEEK 9 OF TERM 2 TO LOOMA REMOTE COMMUNITY AND WEEK 9 OF TERM 3 TO MARBLE BAR. THE STUDENTS SPENT A WEEK WORKING IN THE LOCAL SCHOOL AND RUNNING ACTIVITIES AFTER SCHOOL. The impact of the service trips has been summed up beautifully by Year 10 student, Georgia McArthur. THERE HAS BEEN SO MUCH TO REFLECT UPON IN RELIGIOUS STUDIES THIS YEAR. WE HAVE BEEN CONSTANTLY MAKING LINKS WITH WHAT IS HAPPENING IN THE WORLD TODAY. TAYLA HANCOCK (YEAR 7), REBECCA GARAS (YEAR 7), CHLOE RIDSDILL-SMITH AND JAIME LEIVERS (YEAR 6) The originality and creativity of some young St Mary’s storytellers was rewarded in the Children’s Book Council 2017 Make Your Own Storybook Competition. Tayla won the Year 7 to 8 Story Book category for her book, Tyrone’s Pacific Adventure; Rebecca placed second in the Year 7 to 8 Story Book category for her book, Good Friendships Are Precious; and Chloe and Jaime placed second for their collaboration, Shark Tooth. CHLOE RYAN (Year 7) was an ICAS-Science Medal winner. Chloe’s skills were assessed in five key scientific areas including observing and measuring, interpreting data, applying data, investigating and higher-order skills. ALEXANDRIA MONCRIEFF (Year 7) was awarded first place in the Year 7 to 9 category of the MLTAWA competition, Languages In Our Landscape. TIFFANY TRAN (Year 8) was invited to participate in the 2017 Australian Intermediate Mathematics Olympiad (AIMO) after a very high achievement in the Australian Mathematics Challenge. CHARLOTTE WAUGH (Year 8) was awarded a High Distinction Excellence in the 2017 Royal Australian Chemical Institute's ANCQ. St Mary’s was also awarded 14 High Distinctions and 22 Distinctions. ASHLIN EISZELE, AIMEE RYAN, OLIVIA NOLAN, AND CLAIRE CRAIG (Year 9) were the only WA team selected to compete in the National Finals of the Future ProblemSolving at Knox Grammar in Sydney. OLIVIA NOLAN (Year 9) who won a national and two state awards in the National History Challenge. Olivia was named the National Young Historian winner for Using Archival Records and was also the state winner for that category as well as for the Year 9 category. ISEULT DE MALLET BURGESS (Year 10) was placed second in the Senior Division of the 2017 Future Problem-Solving Australia for Scenario Writing. She has also been invited to attend the 2018 International Competition in Future Problem-Solving in the USA. Iseult’s entry was about Gene Technology. FIONA NGUYEN (Year 10) competed in the Intermediate Division in the Australian Maths Competition and received a prize. This is generally awarded to no more than one in every 300 students (the top 0.3%) within their year group. PHOEBE BLAXILL (Year 11) was first in Western Australia for Year 11 in the 2017 Australian Geography Competition. St Mary’s also achieved first place in Western Australia and seventh in Australia for the 2017 Australian Geography Competition. Phoebe represented WA at the Geography Big Week Out. ELLIE FLINTOFF (Year 11) was commended for her poem, Four Ways to Heroise a Woman, in the 2017 Dorothy Mackellar Poetry Prize competition. This is a national competition and only 20 poems are selected for the Senior Secondary category. Ellie's poem will now feature in the anthology to be produced later this year. IGSSA CHAMPIONS ST MARY’S HAS BEEN CROWNED THE CHAMPION INDEPENDENT GIRLS’ SCHOOLS’ SPORTS ASSOCIATION (IGSSA) SCHOOL FOR 2017, WINNING FIVE OF THE 11 SPORTS ON OFFER IN THE SENIOR SCHOOL (YEARS 7 TO 12) COMPETITION. WE RECLAIMED THE PRESTIGIOUS TROPHY, EDGING OUT A CLOSE-FINISHING PRESBYTERIAN LADIES’ COLLEGE, HAVING FINISHED RUNNERS-UP LAST YEAR AND NAMED INAUGURAL TROPHY WINNERS IN 2014. Our girls showed grit and tenacity this year to claim first place in volleyball, cross country, netball, basketball and softball. We finished third in tennis, soccer and water polo, fourth in hockey and athletics and fifth in swimming. The cross country squad had been training hard since Term 4 last year in preparation for the IGSSA competition and their hard work and determination paid off, winning the trophy by 39 points. Our Year 8, 10 and 11/12 teams all placed first in their age groups. In basketball, St Mary’s made it seven successive years of victory in the overall competition, while in softball the school jumped two places from 2016 to win the 2017 competition. On the tennis court, St Mary’s girls won the Junior B and C pennants, with four of our teams placing second. For hockey, our Senior B team won their pennant, while in athletics, we finished fourth overall, lead brilliantly by captains Michelle Seymour and Sophie Guinness, with special mention of Melany Smart (Year 11) who broke the Year 11/12 1500m record, and Leah Richards who broke the Year 10 hurdles record. RECOGNISING THE ACHIEVEMENTS OF OUR STUDENTS MICHAELA SAVAGE (Year 12) was one of only 10 recipients of the prestigious UWA Fogarty Scholarship for 2018. Established in 2004, the UWA Fogarty Scholarship Programme is a joint initiative of the Fogarty Foundation and The University of Western Australia. KIRA MOLLOY (Year 12) has been awarded a UWA Winthrop Scholarship. It is awarded to eligible, high-achieving Year 12 students to encourage and assist them in undertaking undergraduate studies at The University of Western Australia. TEALE LYON (Year 12) competed in the 2017 International Geography Olympiad in Serbia representing Australia. J.M. BARRIE TELLS US, “ALL CHILDREN, EXCEPT ONE, GROW UP,” IN THE FAMOUS FIRST SENTENCE OF HIS NOVEL PETER AND WENDY, PUBLISHED SEVEN YEARS AFTER PETER PAN’S THEATRICAL DEBUT IN LONDON. THAT ONE REBELLIOUS CHILD EXISTS IN MANY DIFFERENT WAYS TODAY. There is Walt Disney’s redheaded animated, Peter Pan, there are the many different women of Broadway – Mary Martin, Sandy Duncan and Cathy Rigby – who have soared across the stage as Peter Pan, and there is the recent plethora of movies from Hook, to Pan, to Finding Neverland. When I discovered my old, worn and very wellread Peter Pan in Kensington Gardens (1906), with illustrations by the artist Arthur Rackham, it evoked the memory of discovering the Peter Pan statue in Queens Gardens in Perth, as a child. I knew immediately that this was a story I would like the Year 7, 8 and 9 students to discover and to bring to the stage. From 2 to 4 November, the cast of 44 girls embraced and rejoiced in the physicality of the show, performed in The Lady Wardle Performing Arts Centre to a captive audience. Flying and fighting skills were rehearsed with relish. The joy the girls brought to the faces of young and old was a director’s dream come true. OLIVER! OUR SENIOR SCHOOL PRODUCTION BASED ON CHARLES DICKENS’ OLIVER TWIST, THE MUSICAL VERSION OF OLIVER! BY LIONEL BART HAS STOOD THE TEST OF TIME SINCE OPENING ON LONDON’S WEST END IN 1960. GOING TO AN AMERICAN COLLEGE HAS ALWAYS BEEN ONE OF MY GOALS AND I AM THRILLED TO HAVE BEEN GRANTED A FULL ATHLETIC SCHOLARSHIP AT PROVIDENCE COLLEGE, RHODE ISLAND. CANBERRA AND SYDNEY TOUR The first morning on tour started with an interesting walk down ANZAC parade and an introduction to the Australian War Memorial. We spent the afternoon playing European Handball and ultimate Frisbee at the Australian Institute of Sport, and that evening, we had a lot of fun watching The Emoji Movie. The next day was one of my favourites. We went to Floriade and bought some amazing donuts and also treated ourselves to Ben & Jerryâ&#x20AC;&#x2122;s! We also went back to the Australian War Memorial, and drove to the top of Mt Ainslie to get some amazing photos and take in the beautiful views of the city. We learnt a lot at the War Memorial and had a great tour guide who showed us around the World War II gallery. The evening was filled with heaps of excitement and fear as we went down the big drop slide at Questacon. Parliament House was another highlight of the trip. It was very grand and interesting. My favourite places, however, were Old Parliament House and Government House, as they were both so intriguing. OUR NEWLY-INTRODUCED ELEVATE WEEK WAS WELL RECEIVED BY OUR YEAR 12 VOCATIONAL STUDENTS. Endeavour Award for Certificate III in Business - Mary Christie Mary has already been accepted into Curtin College for 2018 where she will be studying a Diploma of Interior Architecture. She has worked with an interior designer for her work placement this year. yy How to buy a safe vehicle and general vehicle maintenance checklist yy Certificate III in Hospitality (units towards) - prepare and serve espresso coffee, serve food and beverage yy Financially Empowered workshop - financial literacy to assist with managing finances yy Tenancy agreements Armed with these skills, and more, our girls will be even more competitive when applying for employment and for their further training at TAFEs and universities. Endeavour Award for Certificate III in Beauty - Tenique Bonney Tenique has developed an impressive photographic portfolio detailing her make-up artistry. Next year she intends to complete the Certificate IV and then Diploma of Beauty Therapy. FOR JUST A MOMENT PUT YOURSELF IN THE SHOES OF A YEAR 12 STUDENT ... IT’S THE TIME OF YEAR WHEN YOU ARE EXPECTED TO MAKE THAT ‘ULTIMATE’ DECISION THAT WILL AFFECT THE REST OF YOUR LIFE … WHAT DO I DO WHEN I LEAVE HIGH SCHOOL? TERTIARY STUDY, GAP YEAR OR SOMETHING ELSE? IF I DO CHOOSE TO STUDY - WHERE AND WHICH COURSE DO I CHOOSE? WHAT HAPPENS IF I DON’T LIKE IT? CAN I CHANGE MY MIND? ALL OF THESE QUESTIONS AND SO MANY MORE ARE ON THE MINDS OF OUR SENIOR SCHOOL STUDENTS. Over the past four years our Year 11 and 12 students have had the opportunity to meet with Old Girls to chat about life after St Mary’s at the Insight Breakfasts and obtain the answers to some of these questions. These breakfast events offer an informal environment where Year 11 and 12 students can gain invaluable, real-world insight into tertiary study and work, from Old Girls in specific professions. Speaking to someone who has walked in those brown shoes, about the field they are working or studying in, can often make that decision-making process a little less daunting. Throughout all of the breakfasts the Old Girls reminded the students to choose their own path and find what they are passionate about. When you combine passion and hard work then success will come. The Old Girls also explained the differences between St Mary’s and tertiary study and encouraged the students to be proactive and seek out opportunities that would benefit their experiences. Thank you to the Old Girls for willingly sharing their experiences and advice with our students. THIS YEAR, AS PART OF NATIONAL SCIENCE WEEK, ELEVEN OLD GIRLS CAME BACK TO ST MARY’S TO SPEAK TO OUR YEAR 11 STUDENTS ABOUT THEIR STEM (SCIENCE, TECHNOLOGY, ENGINEERING AND MATHS) BASED CAREERS. YEAR 12 FATHER-DAUGHTER BREAKFAST As part of their final year celebrations, the Year 12s and their fathers gathered for breakfast in The Polson Room over two mornings in June. The annual event is a special time for the girls and their dads, where they enjoy an amazing breakfast spread and hear from guest speakers. This year the wonderful speakers were Julie O’Meara, a member of the Old Girls’ Association, and Lianne Leung (’13), an Old Girls’ Association Life Member. YEAR 12 MOTHER-DAUGHTER HIGH TEA The sophisticated Duxton Hotel was the venue for this year’s Year 12 Mother-Daughter High Tea. The gorgeous afternoon featured guest speakers, Senior Boarder, Louisa Stead, and Senior Day Girl, Ella Brockwell-Mole. VISITING OUR OVERSEAS FAMILIES International St Mary’s families past, present and future were invited to dinners hosted by Lynne Thomson and Tina Campbell in Singapore, Kuala Lumpur and Jakarta during the Term 3 mid-term break. It is a great opportunity to meet up with families and Old Girls to find out more about their ventures following life at St Mary’s. PA R E N T S ’ SOCIETY FOR OUR GIRLS, 2017 HAS BEEN ANOTHER WONDERFUL YEAR OF ACHIEVEMENTS. EVERY ONE OF THEM HAS ACHIEVED ON SO MANY DIFFERENT LEVELS AS THEY CONTINUE WORKING TOWARDS THEIR INDIVIDUAL GOALS. S T M A R Y ’ S AUXILIARY HERE WE ARE WRAPPING UP 2017! THIS YEAR DIDN’T DISAPPOINT. THE ST MARY’S AUXILIARY HAS HAD A FABULOUS YEAR. New friendships were made and comfortably blended with familiar friends. New events were established to complement our traditional events, and further our community involvement. It is a huge team of parents that bring together all of our events. I can’t express my appreciation and thanks enough for the many parents who have supported me as the President, volunteered their time, baked goodies, attended our meetings or served coffee and tea with a smile. We had some memorable events indeed. The Hot Cross Bun Drive, our relaxing and informative Biggest Morning Tea, Scitech evening, our Annual Lunch – which was a most glorious and fun day – and the Outdoor Movie Night were all very popular. Add to that the Junior School Sports Carnival cake stalls, pizza lunch, assembly morning teas, Grandparents Day and Orientation Day functions and we’ve been kept busy and involved with the School on many fronts. You’ll be pleased to know that all of those events will be returning in 2018. O L D G I R L S ’ A S S O C I AT I O N PRESIDENT’S REPORT 2017 HAS BEEN A YEAR OF CONSOLIDATION FOR THE OLD GIRLS’ ASSOCIATION AS WE PLAN TOWARDS OUR 95TH BIRTHDAY IN 2020. On 18 October we welcomed our newest Old Girls, the Class of 2017, at the Valedictory Service and Dinner. This was an occasion which was full of hope and excitement, and a hint of nostalgia. We wish them all the best in their future endeavours and look forward to hearing of all their successes. With Christmas around the corner please keep in mind our memorabilia – a unique gift for a St Mary’s girl, staff or parent. In closing, I would like to thank the Committee and all the staff who support the Association and I look forward to a productive and enjoyable 2018. ST MARY’S OFFERS A NUMBER OF SCHOLARSHIPS FOR OLD GIRLS STUDYING AT UNIVERSITY ACROSS A RANGE OF DISCIPLINES. OLD GIRLS’ DAY 2018 Save the date … Old Girls’ Day will be held on Sunday 8 April 2018. A special invitation is extended to our Old Girls from the Classes of 1948, 1958, 1968, 1978, 1988 and 1998 who are celebrating their significant anniversaries since leaving St Mary’s. If you would like to be the class rep for your year group please contact us. OLD GIRLS’ ASSOCIATION RECOGNISES STUDENTS’ ACHIEVEMENTS THE OLD GIRLS’ ASSOCIATION NOT ONLY SUPPORTS ST MARY’S STUDENTS ONCE THEY HAVE LEFT SCHOOL BUT ALSO CURRENT STUDENTS. HEAD GIRL, SENIOR DAY GIRL AND SENIOR BOARDER BREAKFAST Mrs Thomson was delighted to invite all of the Head Girls, Senior Day Girls and Senior Boarders from her Principalship back to school for breakfast on Sunday 27 August in The Polson Room. Guests were treated to a special musical performance from Year 12 student, Grace Fu, and we also heard from two Old Girls, Marina Georgiou (’00) who spoke about her time at school and Mrs Thomson’s influence, and Kylie Giles (Wheeler ’97) toasted the School and Mrs Thomson’s commitment and leadership. YEAR 13 REUNION BREAKFAST THE YEAR 13 REUNION IS AN OPPORTUNITY FOR OUR RECENT LEAVERS TO COME TOGETHER FOR A CATCH-UP AND ALSO, HEAR FROM FELLOW OLD GIRLS ABOUT THEIR JOURNEY SINCE LEAVING ST MARY’S. Emily Raynor (’06) and Emily Law (’13), spoke to the Class of 2016 about their time away from St Mary’s, having the courage to change their paths and knowing when to back themselves when others didn’t. They also advised the girls that they should pursue things that make them happy and be true to themselves. Emily Law’s closing comments summed up the messages of the morning well: “You’re not locked into some contract once you leave school. You always have a choice about everything in your life. And there is no such thing as "too late" when it comes to your happiness. You need to stop waiting for the light at the end of the tunnel and go light it up yourself”. We had a wonderful evening with 50 ladies in attendance. Jess Gethin (Walker ’97) was our MC, with speeches by Alison O’Connor (Fair ’97) on behalf of the day girls and Jacki-Lee Munkton (Gillett ’97) on behalf of the boarders. Kylie Giles (Wheeler ’97) proposed the toast. We watched our Leavers’ Day Assembly on video, which was very entertaining, and also reminisced over old photos from our days at St Mary’s. It was over all too quickly, and everyone was enthusiastic about attending our next reunion in five years time! The 52nd annual Combined Independent Girls’ Schools Golf Day was hosted by Penrhos/ Kobeelya at Royal Perth Golf Club in October. NEWS F R O M O L D G I R L S We were delighted to welcome Edna Grime (Peggs ’38) back to St Mary's in October when she came to watch her great-granddaughter and Year 12 student, Antonia, at her final assembly. Elizabeth Ford (Myles �51) and her husband, George, celebrated their 62nd wedding anniversary earlier this year. Congratulations to you both! Jean Shine (Campbell �63) took out first place in the Archipelago-themed class at the World Flower Show in Barbados in July. Her win was against a field of the best floral artists from 32 countries. What makes Jean’s win even more amazing is that things did not go to plan. Firstly, her luggage with her tools and materials did not arrive in Barbados and secondly, her flowers, which she had pre-ordered, were not as fresh as she had expected. She managed to get her luggage back after convincing customs to let her into the baggage carousel. However, an hour into the five-hour competition she had to come up with Plan B when the not-so-fresh flowers started losing their petals. Jean is looking to repeat her success at the world competition in India in 2020. Congratulations, Jean! Joy Hopwood (�86) has completed filming "The Casting Game", a feature film which she wrote, produced and has a supporting role in. It was screened at Hoyts Cinemas earlier this year. Joy was also elected as the New South Wales representative on the Media Entertainment Arts Alliance’s Diversity Committee in June. Congratulations, Joy! It has been an exciting year for Elizabeth Carr AM (�81). Not only was she elected as Chair of the Board of Governors, where she is the first Old Girl Chair of St Mary’s in its 96 year history, but she was also recognised in the 2017 Queen’s Birthday Honours. Elizabeth was made a Member in the Order of Australia in recognition of her significant service to the community. As an active member of a number of boards including Department of Family and Community Services NSW, Disabilities NSW, Australian Institute of Company Directors, Environmental Protection Authority, Kokoda Track Foundation, and South Metropolitan TAFE, as well as our own School Board, Elizabeth has always been drawn to the educational sector so she could give back to it. In her comments to The West Australian she said, she volunteered in roles which “gave her goose-bumps” and usually said yes to everything. “I think it is just the way I’ve been brought up with a generosity of spirit and to be involved.” Congratulations on a wonderful achievement, Elizabeth! The diverse paths our Old Girls follow once they leave St Mary’s are often fuelled by wonder and curiosity. Their ability to question, discover and explore the world has opened many doors and given our Old Girls the courage to tackle the unknown. Discover how curiosity played a part in Old Girls, Ashleigh, Megan and Eliza’s lives. journalism jobs are being lost, which is a concern for our public discourse and democracy. What is your fondest memory of your time at St Mary’s? Sitting out on the grass outside the science department with a big circle of girlfriends every lunchtime. Some of those girls went on to be my bridesmaids and godmothers to my children; they are still among my closest friends. Who has been your biggest influence? My mum and dad have believed in me and encouraged me every step of the way. What accomplishment are you most proud of? I was recognised as the most outstanding young journalist in the Canberra Press Gallery not long after I had begun political reporting and that gave me a huge confidence boost. Since then I feel very honoured that I have been given the chance to represent my news organisation overseas, covering stories like Donald Trump’s election win from Washington, and other major political stories. I’m also proud of implementing a gender target on the programmes I host to ensure that I have gender balance among the people I choose to interview. Three pieces of advice to current students at St Mary’s: 1. Pursue a job you think you will enjoy. There’s no point doing a course just because you have the marks, or just because your friends are doing it. 2. Study overseas if you get the opportunity. It will open your eyes to the array of opportunities out there. You won’t regret it. 3. Travel extensively in your late teens/20s – careers and children make this far more difficult later on! Current role: Sky News political reporter and anchor of "The Latest" Who would be your dream dinner guest? Hillary Clinton. Music you are currently listening to? The Wiggles. Favourite subject at school? English Literature. Sum up your experience at St Mary’s in 3 words: Happy. Nurturing. Empowering. Three pieces of advice to current students at St Mary’s: 1. Your Year 12 exams aren’t the end point of your education. They’re a gateway to further learning opportunities, from which there will be multiple paths to get you to where you want to be. 2. View every setback, disappointment and failure as a positive challenge to learn and grow. Just take some time to reflect on what you’ve already managed to achieve, and how you could approach your hill next time - or as we say in my workplace how can we do this more “betterer”? 3. Be kind to yourself. You’re a lot more awesome than you give yourself credit for! In 30 seconds … Class of: 2003 Tertiary education: Bachelor of Arts (UWA - 2006); Bachelor of Arts with Honours (University of New England - 2007); Master of Archaeological Science (The Australian National University – 2014) Current role: Compliance Manager at Terra Rosa Consulting (but I usually just tell people I’m an archaeologist). Who would be your dream dinner guest? Mary Leakey, who was a palaeoanthropologist, who spent much of her career unearthing fossils and stone tools belonging to our early human ancestors. Favourite subject at school? Art and History. ELIZA STRIBLING (’12) Eliza is an artist, designer and creator. Since leaving St Mary’s she moved to Melbourne to study Communication Design, and is now a product designer at MYOB. In 2016 she was jointly awarded the Helen Judge Art Award, which may have come as a surprise to many of her former St Mary’s teachers as Eliza was not an art student at school. In her first year out of school she found herself in a course she didn’t love and so instead of studying, reading lecture notes or doing assignment research, she started to work on her art. It was around this time that Eliza came across a quote by artist and letterer, Jessica Hische, who said, “the work you do while you procrastinate is probably the work you should be doing for the rest of your life”. That mindset opened her eyes and she realised she needed to follow her dream. How has curiosity helped you get you to where you are today? Without curiosity and a willingness to explore, I would never have gotten to where I am today. I moved to Melbourne a year after finishing school to study design, which was a completely new experience for me. I wasn’t quite sure what I was going to find or where I was going to end up, but that openness has allowed me to learn more and do more than I ever knew was out there. How do you believe St Mary’s nurtured your curious mind? St Mary’s helped me to be curious simply because there was a huge amount of opportunity for exploration. I think the variety of classes that I took in my earlier years definitely nurtured my curiosity, as well as the great trips and different learning experiences that being at a school like St Mary’s allowed. How do you think St Mary’s prepared you for life after school? Coming from St Mary’s gave me a great base to be strong in my convictions. I left school unafraid of trying new things or things I might not be ‘supposed’ to do as a girl. Being around so many other women and being encouraged to be myself in that environment meant that now I am out in the ‘real world’, I am more determined and have belief in my own ideas. I am now working in User Experience (UX) which involves researching what users want and need, and then designing products to make the tasks they have to do to achieve this as easy as possible. I have learnt a lot and already I’ve helped design a system that is being pushed into production. Five years ago, when I was in Year 12, I never would have imagined that this is where I would be now. I didn’t study art or IT, but I still managed to get here by figuring out what I enjoyed and following that path as best I could. I think it is important for all girls to continue to follow their passions and be determined in achieving their goals. There are very viable careers in the arts, and there are career options beyond what you may think of today. What is your fondest memory of your time at St Mary’s? My fondest memories of school all revolve around the friendships I made there. We had some incredible experiences together whilst at school, but the times I spent at lunchtime out on the oval or in the Year 12 courtyard are the ones I cherish the most. Who has been your biggest influence? Obviously, my parents’ guidance has had a massive influence on me. They have always encouraged hard work and doing my best, and having their support has allowed me to explore and try things without having to worry. I know I’m incredibly privileged in this position, and it’s something I’m very thankful for. St Mary’s helped me to be curious simply because there was a huge amount of opportunity for exploration. What accomplishment are you most proud of? I am most proud of my acceptance into design school. Art was not something I studied at St Mary’s and I was unsure at the time, but my portfolio and interview went well so I was able to study something that I’m incredibly passionate about. I’m very proud that I was able to achieve this, and to move to Melbourne to study by myself. It was all a great adventure, and one that I am also very lucky to have had the ability to experience. Three pieces of advice to current students at St Mary’s: 1. Always be learning. It doesn’t have to be formal education, but trying to learn something new every day is the most important thing for keeping yourself happy and engaged. 2. You can always change your mind, and life is iterative. You have a lot of time ahead of you to try different things so just go ahead and do what feels right now. If it stops feeling right then try something else. The world is growing and changing so dramatically, you never know what’s going to be out there when you’re ready for it. 3. Believe in yourself. You have an incredible start in life already but working hard and backing your ideas are so important to getting wherever you want to go. In 30 seconds … Class of: 2012 Tertiary education: Bachelor of Communication Design (Monash University) Current role: Product Designer at MYOB Favourite subject at school? History Sum up your experience at St Mary’s in 3 words: Varied. Supportive. Friendship. “BE CURIOUS ABOUT HISTORY … BE HISTORY DETECTIVES … LET’S WALKABOUT OUR HISTORY … OUT WITH THE SPY GLASS AND INTO THE PAST WE GO!” THESE ARE JUST SOME OF THE MANY CATCHPHRASES I USE TO ENGAGE THE YEAR 3S AS THEY COMMENCE THE ST MARY’S PAST AND PRESENT PROGRAMME. Part of the programme includes learning about the history of the Chapel of St Mary and the Chapel Gardens. Obscured from view in the bell tower of the gardens is our Chapel bell, named Annie. Originally cast in 1891 in Croydon England, it was donated by the York Bellringers Society in memorial to Old Girl, Dana Weeks (’91). Producing a high, sweet tone, Annie is rung to notify of and call to Chapel services. Other bells that date from before the 14th century in St Martin-in-the-Fields and rang out with the departure of Captain James Cook from England, created a joyous and reflective moment for the Year 5s on their Heritage excursion to Perth city. “Draw how the sound of the bells makes you feel … draw the sound of the bells.” These were the words of Marie McNeil, Junior School Art Specialist, when the Year 5s were listening to the Swan Bells ring out over Elizabeth Quay. After asking a very helpful construction worker to down his drilling tools so the girls could hear the bells clearly, I was astounded how the city air, normally jammed with traffic noise and the buzz of a busy metropolis, became still and filled with the ringing of the bells and the echoing response of the surrounding birds. The girls drew their reaction to the sound of the bells and went on to play with the chain of Love Locks on the bridges across the water to the Swan Bell Tower. Lead by Richard Offen and Joy Lefroy from Heritage Perth, the girls also sketched the Duyfken 1606 Replica docked at Elizabeth Quay and conducted interpretive visits to the Supreme Court, Cathedral Square and the surrounding gardens and heritage buildings. With memorable storytelling, the intergration of art, music, biology, geography and history, what could have been a very traditional excursion became an exciting journey through the very early settlement of the Colony in Western Australia. DONATIONS THANK YOU TO ALL OF THOSE FROM THE ST MARY’S COMMUNITY WHO HAVE DONATED TO THE ARCHIVES, VOLUNTEERED THEIR TIME AND KNOWLEDGE TO THE PROCESSING OF NEWS-CLIPPINGS AND PHOTOS, ASSISTED RONDA BECK WITH THE ORAL HISTORY PROGRAMME AND THE CENTENARY LIST OF STAFF AND STUDENTS, AND LOANED THEIR PRECIOUS MUSICAL INSTRUMENTS FOR THE ‘MUSIC AT ST MARY’S’ DISPLAY. IT IS WITH SADNESS THAT WE RECORD THE DEATHS OF THE FOLLOWING MEMBERS OF THE ST MARY’S COMMUNITY. Molly was the elder daughter of Bishop Riley, the founder of our School. Living in the rectory at West Perth, her early life was centred around the Parish Church and the School. Molly began at the School in 1926 – and obviously enjoyed her student days. Her school days would have been very full – she was involved in drama, loved drawing (received a distinction in her Leaving exam). She played hockey and tennis – she was still playing tennis when she was 70 years of age! Her last year at school saw her become Head Girl in 1937. Her loyalty to the School was shown by her joining the Old Girls’ Association in 1938; becoming a donor when the School began to move out to Karrinyup; supporting the establishment of the Dannatt Bursary; and donating various documents to the Archives Centre. Molly attended the many events at the School – always keen to hear and see how the students were getting on, and enjoying time spent with the Year 4s telling them about her school days. Not many know that when she was nearly 70 Molly decided to go to university – she wanted to do anthropology. For many years Molly and her husband Mick, had lived in Africa and she felt she had a good understanding of the people, so that would stand her in good stead. However, when interviewed, her professor pointed her towards doing psychology, which to the delight of family and friends saw her obtaining her degree a few years later. My friendship with Molly began with a meeting with her in the Rectory at Applecross in 1957. On leave from Africa she stayed with her brother, Bill. I was working in the parish as a Deaconess. When she and Bill finally returned from Africa they lived in the cottage at Watermans Bay, which had been built many years before by Bishop Riley as a holiday home. Joan grew up in Claremont and attended St Mary’s in West Perth between 1936 and 1939. She married Olympic High Jump champion, Peter Winter, in 1949. Peter was something of a trailblazer at St Mary’s — one of the first, if not THE first, male teacher. I was Head of the Science Department at the time when Peter came in as a science teacher, in particular, a physics and chemistry teacher. He therefore arrived in 1983 as something of a curiosity, and no one was sure what passed as appropriate dress for a male teacher. Peter set the standard – rain, hail or shine, he wore shorts, collared shirt and, if he had to, a tie. This was how he felt most comfortable. Mr Atkins was a member of the Board of Governors between 1955 and 1982. During that time, he served as Vice Chairman for sixteen years (1957-1962 and 1971-1982) and Chairman between 1962 and 1971. As Chairman, Mr Atkins played an integral role in acquiring the land for and developing St Mary’s at Karrinyup. 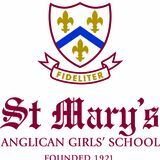 Mr Atkins established the St Mary’s Foundation in the early 1980s, a forerunner to the St Mary’s Anglican Girls’ School Foundation, with the sole aim of supporting students whose families encountered financial difficulties. What better way to celebrate than with a glass of St Mary’s Frankie’s Folly Chardonnay or Cabernet Sauvignon? The wines are made from grapes grown at the St Mary’s at Metricup vineyard in the heart of the Margaret River wine region and are produced by award-winning winery, Redgate Wines. To place your order, please visit www.frankiesfolly.com.au or telephone (08) 9341 9105.